It’s important to me to do what I can to help foster the next generation of naturalists by organizing and serving as a judge for a Student Nature Writing Contest. Reviewing the entries each spring is immensely satisfying—a welcome antidote to the oft-voiced sentiment that nature no longer has a place in young people’s lives. The judges agree: every student who contributes is a winner, by virtue of taking the time to reflect on their relationship with the natural world. 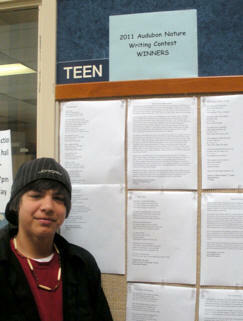 And the winner is… Rowan Baker, an 8th grader who attends Sunny Brae Middle School (near Arcata). Mercedes Butterworth, an 8th grader who attends Sunny Brae Middle School was the 2nd-place winner. Ciara Cheli-Colando, a home-schooled 7th grader, was the 3rd-place winner. Rowan’s, Mercedes’s, and Ciara’s entries were published in both the print and on-line (www.rras.org) versions of the May-June 2011 Sandpiper. The judges encourage you to check out their work on-line. Honorable Mention went to Emilia Bell and Maddy Fraser, 7th graders who attend Salmon Creek Community School (near Garberville); Tessa Opalach, a 12th grader who attends Arcata High School; and Sean Taggart, an 8th grader who attends Sunny Brae Middle School. Unfortunately, there was insufficient space to publish the work of the Honorable Mention winners in either the print or on-line versions of the Sandpiper. However, the judges were so impressed with the quality of the submissions this year that I made arrangements with RRAS to post the work of the Honorable Mention winners here. The judges congratulate all those who submitted entries. We had a difficult time making our final decision. Without further ado, here are this year’s Honorable Mention winners. I see them among the morning dew. The birds fly high, two and two. Nature and the wild mean much to me. I see the blackbird and eagle, flying by. The stream makes a joyous sound. With this place I am willing to bond. In this nice week of May. Watching the squirrels busily pass. Hosts many a thing without much haste. It gives life and lets its creatures eat. For it must stay like it was in that nice week of May. The sparrows' songs warm my heart. The tiny starlings quickly dart. The blackbirds flutter, up and down. The raven soars in a velvet gown. The red-tail hawk glides swiftly by. Hear the scrub jay's warning cry. He finds some worms on which to dine. It echoes across a sky so blue. Each note picked up on the Humboldt breeze. Though I discern them loud and clear. 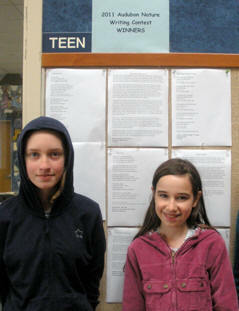 (From left) Maddy Fraser (Honorable Mention), Emilia Bell (Honorable Mention). Imagine a forest floor, blanketed by spruce needles and damp with recent rainfall. Large drops of water still fall sporadically from the canopy. Listen to the silence. Watch the sun seep through the trees and illuminate patches of earth. Among the expected colors, imagine a small bit of brilliant orange. Envision the curiosity of finding something rare. Imagine finding a chanterelle. Chanterelle is the common name for a local mushroom. It grows, among other places, on the ten acres of forest where I have lived for seventeen years. When I was a child mushrooms attracted me because in addition to their vast array of shapes, sizes, textures, and colors, some are edible. My parents inducted me into the mushroom hunting family tradition long before I knew how to read. The ability of a person to harvest mushrooms in the backyard and cook them for dinner enamored me. The process contrasted the mundane grocery store routine I was accustomed to. Soon, I begged to go mushroom hunting. I loved spending time with my family outdoors, taking advantage of our beautiful home. Now we hunt regularly for hedgehog and bolete, but the prized jewel is chanterelle. We hold competitions to see who can find the most or the largest. Our record is nearing six pounds of mushrooms. Usually with paper bags bulging with earthy goodness, we come home and crowd around our kitchen scale, betting to the ounce on how much our bounty weighs. The first rain means the beginning of mushroom season, when I can come home from school and go foraging. I welcome the sweet scent of moisture as I brush needles away, looking for round caps emerging from the earth. I make clean cuts, leaving the spore to grow back and simultaneously marking a trail of where I’ve been. I think nature is relaxing. I like the sounds of ocean roaring and the waves when they crash on to the beach. It’s fun to stay up late and listen to the river rushing downstream and hearing the fish jumping out of the water. I love to hear the bird sounds in the morning and the rooster crowing. Sometimes if I wake up early enough I can see the pink sunrise. I like the wide variety of all the different shades of green in the trees. I thought it was cool when I saw the reflection of the sun off my peacock’s wings. I like the smell of fresh saw dust from a big redwood tree. When I was little I loved the salty wind coming from the ocean thinking it came from half the way across the world. I hated the smell of cows and I still do. When I am at the river bar, I like the sand between my toes. It feels all warm and smooth until I get back to the car. I like to run my hand down a fresh caught salmon’s back. It is fun to jump off a high rock and splash into the cooled water. I like the taste of fresh deer meat. It reminds me of when I lived on the Rezz. I remember when I was little I loved smoked salmon. I would always sit outside of the smokehouse just to get a smell of the salmon. I would go to a brush dance and try acorn soup but I never really liked it. My people have lived along the Klamath River for over 7,000 years and we hope to live here for another 7,000 years. I am a Yurok Tribal member. I was raised all the way up and down the Klamath River.